Whatever your moving needs may be, our Hercules movers will help you feel at home. Our professionally-trained student-athlete Meathead Movers and our moving concierge will be with you for the entirety of your move to Hercules. Welcome to Meathead Movers of Hercules! Our professionally trained student-athlete Hercules movers and moving concierge service are eagerly waiting to create the perfect move experience and satisfy your every moving need. If you are moving to or from anywhere in Hercules, we are the only moving company for you! No matter who we help, all our customers appreciate our dependability, reputation, and value. We enjoy sharing in the excitement they have moving into their first home, especially one located in a city named by Forbes Magazine as a Most Livable Metro-Area suburb! With a comprehensive Noise Element Plan, you can rest assured knowing that you are living in a serene and peaceful city. 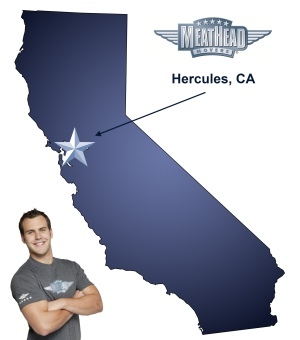 If you are considering a move to Hercules, you should look at Meathead Movers. We take the hassle out of navigating your move. We’ll navigate busy freeways for you, and with our fixed price rates on long-distance moves you can avoid unwarranted hidden fees. Whether you are moving to, from, or within California, we are here to support you along the way. Our services range from local moving, long distance moving, and even on-site moving, rearranging your home/office or loading rental trucks. Since 1997, we’ve been moving people from all parts of California, and have earned the reputation as the go-to moving service to get your move done right. Our all-American clean-cut student-athlete Hercules movers are meticulously equipped, painstakingly trained, and 100% dedicated to making sure you receive the best value for your hard-earned dollar. As you may have heard, our movers jog when not carrying anything, which saves you valuable time and money. In preparation for your move, please make use of our handy Moving Checklist. Also, check out our amazing packing professionals, Princess Packers. These are just a couple of the tools that we have created to help you with your move. We know moving is stressful, but it’s our job to ease your transition and we take pride in doing it well. When you entrust your move to Meathead Movers, you can rest assured knowing that your move will be a success because our professionally trained student-athlete Hercules movers are the best movers the industry has to offer. We are so confident in our services that we even offer a 100% satisfaction guarantee. In fact, you can see what your neighbors have to say about our Hercules movers! Contact us today for a free no-obligation quote and see how we can help you on your next move! Moving to Hercules? Here are some helpful resources.